Fiscal Cliff Siren: Meet The Man Behind The Curtain : It's All Politics Debate over the so-called fiscal cliff has dominated the post-election agenda. But the challenge of dealing with long-term debt and the annual deficit has been brewing for years. And one man who has kept his focus and money on that target is the billionaire Peter G. Peterson. 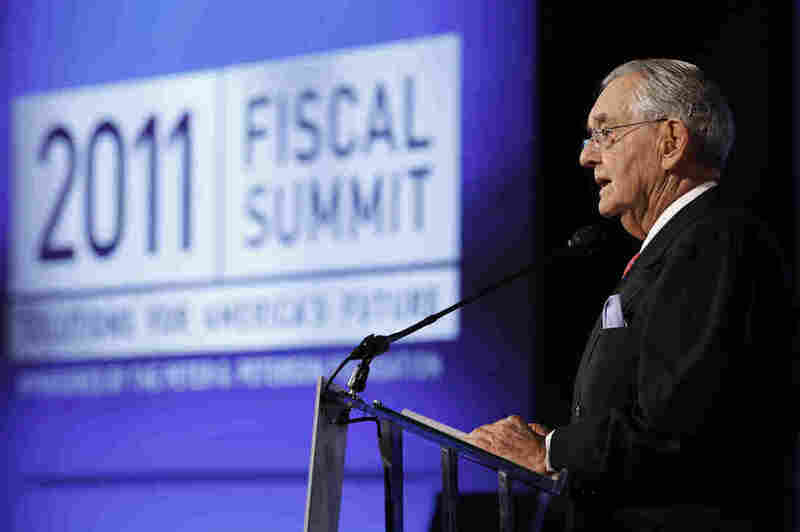 Peter G. Peterson speaks at the Fiscal Summit in Washington, D.C., last year. The event was sponsored by the Peter G. Peterson Foundation. Debate over the long-term debt and the annual deficit has dominated the post-election agenda. Both the White House and Congress want to avert massive budget cuts and tax hikes early next year, a situation popularly called the "fiscal cliff." The challenge has been brewing for years. But its current prominence owes much to the decades-long lobbying of billionaire Peter G. Peterson and his private foundation. "For over a quarter of a century, I've been railing relentlessly, and boring others — and sometimes even myself — over our long-term, unsustainable debts," Peterson said in typically self-deprecating remarks at a conference held last week in Washington. While he was once U.S. commerce secretary, that was four decades ago under President Richard Nixon. Still, it was Peterson's money that helped create the Simpson-Bowles commission, which crafted one proposal combining tax hikes and spending cuts. And his is the money behind the Committee for a Responsible Federal Budget and its Fix the Debt campaign. "As long as people are worshiping the great god of re-election ... then we're going to have a hard time getting to the Promised Land," said Erskine Bowles, appearing last spring on the Charlie Rose TV show. Peterson was also behind the task force headed by fiscal expert Alice Rivlin and former Sen. Pete Domenici, R-N.M.
"I believe leadership, including leadership from the president, is going to make this a war, a war on this debt. And if we do that, we might win," Domenici said two years ago on PBS NewsHour. After serving in the Nixon administration, Peterson moved into investment banking and private equity — and did very well. When he retired, he was a billionaire, but one with a cause. Think tanks from the Employment Policies Institute on the left to the Heritage Foundation on the right were at the conference last week talking about their proposed solutions, which are funded by Peterson Foundation grants. Other groups Peterson has backed include The Concord Coalition, which he co-founded, and the grass-roots organizer AmericaSpeaks. All in all, the Peterson Foundation has given out nearly $26 million over the past three years, almost all of it aimed at attacking the debt. At the liberal Campaign for America's Future, Robert Borosage questions if that's the right strategy. "Fix the debt, as opposed to fix the economy. Right?" he says. "And there's a big difference between the two when you're in the midst of a faltering recovery and you've still got over 20 million people in need of full-time work." Borosage says Peterson spread money around, so now the national debt is on everybody's agenda. "If he can get liberal groups to argue about the debt, and conservative groups to argue about the debt, and they argue about it in different ways, I think he sees that as success," Borosage said. Borosage and other liberals argue that dwelling on the debt will mean drastic cuts in programs that help low- and middle-income Americans. This isn't at all what Peterson says he intends. In a video posted online by the foundation, he said this about safety-net programs such as Medicare, Medicaid and Society Security: "I would hate to get, to permit ourselves to get into a position where these programs for the vulnerable were cut." As for the notion of sparing high-income "job creators" from higher taxes, he says: "I would think that if the upper-class suffers far more than anyone else, both in terms of tax increases and benefit cuts, the middle-class would be far more willing to accept at least some sacrifice." But setting intentions aside, it's extremely rare that any one individual has so much impact on a big policy question. Peterson's son, Michael, the foundation's president, tells NPR that his father's role isn't really all that powerful. "I think the main reason we are seeing a chorus of individuals calling for a solution on our fiscal challenges is because it's so obviously hurting our economy," he says. But others say Peter G. Peterson has largely driven the debate. "I would call him the conductor of an orchestra of many people and events, that have put a focus on debt and the deficit since the mid-'80s," says James Thurber, a professor at American University where he oversees the Public Affairs and Advocacy Institute. It's an orchestra that few would have the stamina, or the financial wherewithal, to assemble or conduct.